Used 2015 Challenger, 32,732 miles, options include: Fog Lights, Leather Seat Trim, Satellite Radio, Power Windows, Automatic Climate Control, Heated Seats, a Premium Alpine Sound System, Heated Steering Wheel, Push Button Start, Rear Parking Aid, a Heated Passenger Seat, Paddle Shifters, a Back-Up Camera, Keyless Entry, Steering Wheel Audio Controls, Aluminum Wheels, WiFi Hotspot Capable, an Onboard Hands-Free Communications System, Multi-zone Climate Control, Keyless Start, Electronic Stability Control, a Premium Sound System, a Navigation System, Air Conditioned Seats, Heated Mirrors, Power Mirrors, Steering Wheel Controls, Rear Wheel Drive, a Power Drivers Seat, Brake Assist, an Adjustable Lumbar Seat(s), a Leather Wrapped Steering Wheel, Power Locks, a Electronic Messaging Assistance, Traction Control, Daytime Running Lights, an Auxiliary Audio Input, an Anti Theft System, a Compass, a Rear Head Air Bag, an Adjustable Steering Wheel, Cruise Control, Bluetooth Connection, Tinted Glass, a Pass-Through Rear Seat, Air Conditioning, a Cell Phone, a Driver Illuminated Vanity Mirror, a Locking Rear Differential, a Gasoline Engine, Bucket Seats, Disc Brakes, a Drivers Air Bag, an AM/FM Stereo, a Tire Pressure Monitoring System, a Garage Door Opener, an Auxiliary Power Outlet, Anti-Lock Brakes, an Auto Transmission with Manual Mode, an MP3 Compatible Radio, a Front Head Air Bag, a Passenger Illuminated Visor Mirror, an Auto Headlamp, a Front Side Air Bags, a Center Console, Adjustable Head Rests, Intermittent Wipers, an Auto Dimming R/V Mirror, a Passenger Air Bag, a Rear Window Defroster, a Beverage Holder(s), a Trip Computer, Power Steering, a Spare Tire (Small Size), a Center Arm Rest, a Tilt Steering Wheel, Vanity Mirrors, Variable Speed Intermittent Wipers, a Digital Clock, and a Trip Odometer. This 2015 Dodge Challenger 2dr Cpe R/T Plus, Stock number 19347 features a Ivory White Tri-coat Pearl exterior. Factory equipped with an impressive 8cyl, 5.7l, 372.0hp engine, an transmission: 8-speed automatic 8hp70 transmission and rear wheel drive, this Dodge Challenger is ready to conquer the roads! 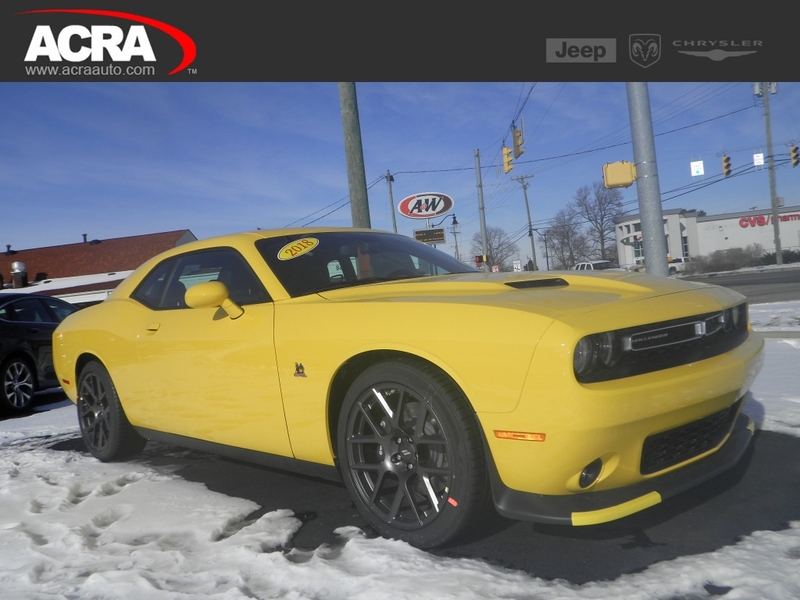 Contact us today to schedule a test drive of this 2015 Dodge Challenger 2dr Cpe R/T Plus! Or stop in at 2820 North National Road Columbus, IN to check it out in person!